The Fujifilm FinePix F660EXR is a digital camera with an Advanced Compact designation. Stand-out features of the F660 include a 16 megapixel EXR CMOS 1/2 inch sensor, 15x 24-360mm equivalent zoom lens, 1080p Full HD movies, 8fps continuous shooting and a 460,000-dot 3-inch LCD screen. The F660EXR bursts with other technology to aid photography as well as full manual control for the more advanced user. 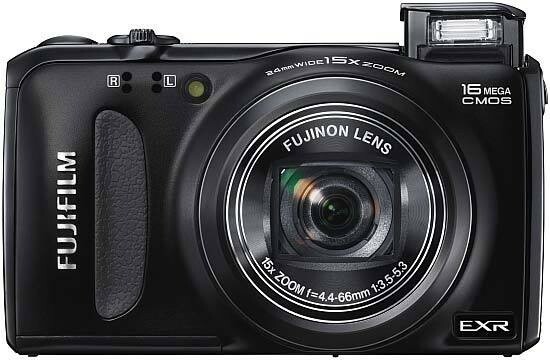 Priced at around £185 / $245, the Fujifilm FinePix F660EXR digital compact camera is available in Black, Red, Blue and Champagne Gold. From opening the box, we instantly took a liking to the F660EXR from Fujifilm. It slots into the Advanced Compact range as it offers all the functionality of a user friendly point and shoot with the advanced features of a manual prosumer. The design is an interesting affair. It looks like the basic design of a camera (a box with a hole on the front) has been used then as things have been added, they've had to bulge the box out a bit to accommodate it. The body sweeps out to meet the bezel of the lens and also curves up a bit at the top. There's a slight thickening at the right side for a hand grip and it's these fluid-like curves that make the camera look more interesting than other models in the same price bracket. It looks borderline organic. There's no visible flash because it's a pop-up type on the left shoulder which is enabled by pressing a small button on the side. On the top plate, there's only the power button and shutter release with the zoom rocker wrapped around it. The command dial sits angled on the right shoulder to be operated by the thumb. It is easy enough to do this as the wheel is extremely free. In fact, we were constantly having to put it back in the mode we wanted simply after taking it out of our pocket. The bulge on the back of the Fujifilm FinePix F660EXR to allow more space for the wheel also acts as a handy little thumb rest although Fujifilm have provided a dedicated area. The navigation pad on the back also has a wheel around its circumference. The icons on the pad can be pressed and it doubles as a tool for moving around the menu system. In fact, most of the buttons on the back have at least two operations to perform. The exceptions are the playback and direct video record buttons, which are exclusive to those modes, and the up button that acts as a exposure compensation button when shooting, up button in the menu and delete button when in playback. Fujifilm have seen it fit to retain the FinePix F button. The FinePix button is all about film simulation. It allows access to ISO, resolution, continuous shooting, anti-blur and Film Simulations. The simulations that Fujifilm have added to the F660EXR are Provia (default), Velvia, Astia, B&W and Sepia. When the EXR button is selected on the command dial, the camera will default to the EXR auto mode. This will choose between the three EXR modes of Resolution Priority, High ISO & Low Noise or D-Range priority. You can select either of these if you want to by pressing the Menu button. The Adv. option is home to some of the Pro features of the camera such as Pro Focus, Pro Low-Light, Multiple Exposure, 3D Image and Motion Panorama. The latter is a similar system to the Sweep Panorama pioneered by Sony a few years ago. Pro Focus uses a technique that Fujifilm started implementing on their bridge cameras originally. It takes two pictures; one in focus, one slightly out. It then merges the two and uses the focused picture to keep the subject sharp and the blurred one to throw the background out of focus. Essentially, it recreates a good depth of field. The build quality is excellent on the Fujifilm FinePix F660EXR. It feels solid thanks to the metal body but it also has a comfortable weight to it that gives you the satisfaction of actually holding something. There are four minor points on the camera build. Aside from the aforementioned command wheel and menu dial on the back being a bit too easy to move, the battery door has no metal backing to it and the USB cover has flimsy plastic hinges. However, the actual cover is a hard plastic instead of the typical rubber. The metal tripod bush, 3 inch LCD screen that sits flush to the body and firm buttons all make for a successful camera. Fujifilm cameras have always been very easy to use through the menu system and although the F660EXR is no exception, the menu systems have been split down into separate sections which could create confusion to anyone coming into photography for the first time. In the past, they had one or two menus, now there's the EXR menu, SP menu, Adv. menu, Main menu and FinePix menu. There are two continuous shooting modes: Continuous and Best Frame Capture. In Continuous mode, we managed to get 15 shots in a 10 second period which averages out to around 1.5 fps (frames per second). The camera starts off fast managing three pictures per second for the first three seconds. It then slows down as the buffer reaches it's maximum capacity. Best frame capture will start taking pictures as you press the button down to focus. It records these at 8 megapixel at a speed of 11fps. Once you press the button down it records 16 frames at full resolution and the previous pictures at 8 megapixel. This gives you the opportunity to select the best shot. Flip the camera into Program and you get a lot more in the continuous modes. There's a handy Dynamic Range Bracket, Film Simulation Bracket (for when you simply can't choose) and an AE Bracket. Start up time of the Fujifilm FinePix F660EXR from off to focusing and taking a picture was just over two seconds. A good result and slightly faster than other compacts we've tested recently. This is despite the agonisingly slow start up. It's like lighting a fuse and waiting for the explosion. Then suddenly the camera bursts into life so hard and fast, you can feel the camera move as it does. We got an unusual result from the F660EXR when testing the shutter lag. We kept getting a result that suggested the camera doesn't suffer from shutter lag. At all. To be fair, we test all cameras at least five times to ensure it's not reflexes or nerves. We got a slightly delayed result at the end of 0.04sec. Even if the camera does run at the latter speed, it's still very fast. Roughly twice as fast as other compacts in this price range. In playback, the picture will be displayed full screen as default with some basic shooting information such as: Resolution, ISO, Dynamic Range, Date & Time, Aperture and Shutter Speed. Pressing the Disp button at the bottom will bring up a small menu of options for display modes. The options are: Information, Information Off, Favourites and Detail Information. The latter option will change the full screen preview to a thumbnail, show more information such as Flash status, film simulation used, White-Balance settings and a Histogram. In the box, there's a camera, battery, charger, USB lead, wrist strap and video output lead. Bear in mind that the opposite end of these leads is analogue and makes any HD quality redundant. The paperwork is the basic quick start guide with the full manual on the accompanying CD software. The editing and viewing software is MyFinePix Studio ver. 3.2 for Windows and FinePix Viewer ver. 3.6 for Mac.